Named for a somewhat elusive Greek goddess, Dione, the Dion Skipper has been appropriately elusive in Massachusetts. It is still quite a surprise when this wide-ranging species turns up. It apparently prefers calcareous or at least non-acidic wetlands north of about New Jersey, and therefore suitable wetland habitat is found almost solely in the western part of our state. Dion Skipper has recently been found in more locations in western Massachusetts than previously thought, and may be either extending its range in Massachusetts, arriving from either Connecticut or New York or both, or simply becoming more common. Scudder did not include this species in his magnum opus on New England butterflies. Dion Skipper either did not occur in Massachusetts in 1900, or, more likely, was so uncommon that it had not been found. There are no 19th or early 20th century Massachusetts specimens in the Harvard MCZ. Scudder conflated Dion Skipper and Palatka Skipper. He knew of “palatka” specimens from the midwest and Florida, but none from New England. It was W. H. Edwards who first described and named Dion Skipper from an Indiana specimen (Miller and Brown 1981). Some authors recognize today’s southern populations as a separate sub-species E. dion alabamae (e.g. NatureServe 2011). Dion Skipper has a curious distribution today. It is absent from the whole southeast Appalachian Mountains area, but is found along the Atlantic coastal plain from Florida north to Long Island. North of that, it occurs only inland: in western Connecticut, western Massachusetts, Vermont and Quebec. It is found in Quebec and Ontario in southern Canada, through the Great Lakes area to the upper midwest, then south down the Mississippi River valley to the gulf states (Cech and Tudor 2005; Opler and Krizek 1984; Layberry 1998). Lepidopterist Arthur Shapiro traces this odd biogeography to the pattern of postglacial re-colonization. According to Shapiro, Dion Skipper is one of several sedge-feeding, marsh-dwelling skippers which re-colonized southern New England (at least north to Connecticut, in this case) after the glacial era by moving north along the Atlantic coastal plain. Along with the Black Dash, Mulberry Wing, Two-spotted, and Broad-winged Skippers, Dion Skipper may have migrated across New York to re-enter the Great Lakes areas from the east --but it probably also reached the Great Lakes by migrating north along the Mississippi River. Shapiro points to a noticeable “disjunct” in New York between the Atlantic coastal plain populations of these skippers and the Great Lakes populations, which he attributes to the subsequent drying up of intervening marshes (Shapiro 1970b, incl. maps). Dion Skipper today is found mostly in southwestern New York on the one hand, and Long Island on the other (Opler and Krizek 1984; Shapiro 1974). The Dion Skippers being found today in Massachusetts may have migrated north from western Connecticut, and may be from the coastal plain subpopulation rather than the Great Lakes population. The earliest Massachusetts record, according to Dr. Dale Schweitzer’s Atlas account, is from 22 July, 1962, near South Egremont (Berkshire Co.), O. R. Taylor (specimen at Yale). There are two records from the Atlas period: 11 July 1986, Hancock (Berkshire Co.), R. Wendell, and 18 July 1986, Stockbridge (Berkshire Co.), D. F. Schweitzer (specimen at Yale). Schweitzer complained in the 1980’s that western Massachusetts calcareous fens were “depauperate” in expected lepidoptera (probably mainly moths), whether from gypsy moth spraying or other causes. But he pointed out that because the Dion Skipper is a strong flier which can occupy a variety of wetland types, it was a good colonizer and might be expected to reappear. 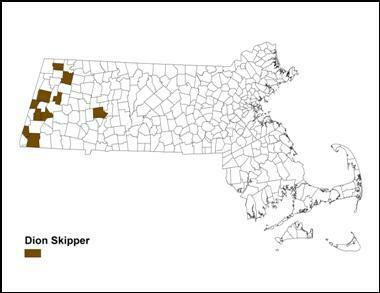 Still, the low numbers of Dion Skipper in our state have resulted in its being listed as Threatened under the Massachusetts Endangered Species Act. The 1990-95 Connecticut Atlas found Dion Skipper using Carex lacustris in the wild, but also raised it on yellow nut sedge (Cyperus esculentus) in the lab (O’Donnell et al. 2007). In New York its host plant is also Carex lacustris (Shapiro 1974), and this may be its only host plant in Massachusetts. Carex lacustris is native to and found in most Massachusetts counties except Barnstable, Dukes and Nantucket (Cullina et al. 2011). Elsewhere Dion Skipper also uses Carex hyalinolepis and Scirpus cyperinus, and may possibly use Carex stricta (Scott 1986; Layberry 1998). The known habitat in Massachusetts is sedge meadows, including calcareous fens, riparian marshes, stream corridors, and wet meadows (NHESP, 2/2010) . It was first found in a high quality fen in Massachusetts. Adults nectar in upland fields near the wetland. Some authors suggest that there are habitat differences between northern and southern populations of Dion Skipper, and that the southern populations make use of a greater variety of non-calcareous and disturbed wetlands (e.g. roadside ditches) and are less associated with Carex lacustris (NatureServe 2011; Glassberg 1993). Throughout its large but unusual range, Dion Skipper apparently exists only in scattered colonies with low population densities. In Massachusetts, the skipper could be much less common than is its habitat. Habitats can be small (a few hectares, at least for southern populations), and populations often appear small (20 or less) (NatureServe 2011). After the Atlas period, Prof. Dave Wagner found a large number of Dion Skippers in Sheffield: 20+, July 1993, and 30+ at the same location in July 1994 (MBC records). Alerted by these reports, butterfly observers began looking for and finding more and more Dion Skippers, particularly on the three Berkshire NABA Counts, which coincide with this species' flight time (Stichter 2009a). Dion Skipper has been reported in 18 of the 22 years 1992-2013 (Chart 104). It was missed in only four years. This sighting frequency is similar to that of some of our late-season southern immigrants, such as Ocola Skipper or Fiery Skipper, however Dion Skipper is not a seasonal immigrant; it undoubtedly overwinters. It has either extended its range to include Massachusetts, or was here unnoticed and is becoming more common. The 1986-90 Atlas had Dion Skipper records from only two Atlas blocs in the Berkshires, from one year (1986), and therefore found Dion Skipper to be Rare. MBC records 2000-2007 also rank it as Rare (Table 5). However, given the frequency and consistency of sightings over the last 22 years, and the movement westward to Hampshire and Franklin Counties, it should now probably be classed as Uncommon. The well-known list-length analysis of MBC records 1992-2010 did not find any significant change in the detectibility of this species (Breed et al. 2012). However, this methodology omits single-species reports, such as the 1993 and 1994 reports of a sizeable Dion Skipper colony in Sheffield, and other Dion Skipper reports. Since Dion Skipper was found in numbers in Sheffield in 1993, the number and spread of its locations expanded quickly (Maps 104a and 104b), whether due to increased observer effort and attention, or, more probably, to an actual range extension. Between 1993 and 2009 Dion Skipper was found in ten towns, as shown in Map 104a. MBC records show sight or photo reports from six towns: North Adams, Savoy, Richmond, Hinsdale, Sheffield, and Northampton Fitzgerald Lake. The finding of a colony in North Adams was significant, because at the time it marked the northernmost extension of Dion Skipper in this state. The first report from this area, a large wetland over a mile in extent, was during the Northern Berkshire NABA count in 1996. The site has since been visited by a number of butterfly observers; photos by T. Murray, shown at www.massbutterflies.org , were taken there in 2004. There are 2003 and 2004 photos from Sheffield (M. Nelson, NHESP Fact Sheet 2/2010), and 2009 photos from Hinsdale by B. Higgins (above and Massachusetts Butterflies 33, Fall 2009). In 2008 and 2009 the Massachusetts Natural Heritage and Endangered Species Program confirmed or re-confirmed sightings in four additional towns, Egremont, Stockbridge, Pittsfield, and a new site in Lee. These sightings were made by T. Lautzenheiser of MassAudubon, and they also appear on Map 104a. 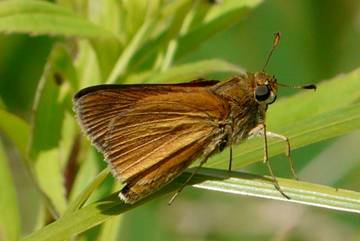 Also in 2009, photos of two Dion Skippers by K. Gardner, and reports of more, at Fitzgerald Lake in Florence, Northampton, became the first record ever for Hampshire County. This was the easternmost location so far and suggested that Dion Skipper might be moving east. Dion's presence at this site was re-confirmed in several subsequent years (e.g. 2 on 7/5/2013, B. Benner et al.). In 2010, Dion Skipper was first reported from MAS Graves Farm in Williamsburg (1, 6/27/2010, B. Benner), and from Cummington (2, 7/11/2010, B. Spencer), two additional towns in Hampshire County. These provide a spatial link to the Berkshire County sightings. In 2012 Dion Skipper was reported from Windsor Notchview TTOR (1, 7/12/2012, T. Gagnon et al., F. Model photo at http://www.flickr.com/photos/fsmodel/7565030854/in/photostream/ ). In 2013 Dion Skipper was found in Williamstown at Field Farm TTOR (1, 7/13/2013, T. Armata, photos), the new northernmost location. And in another significant eastward report, Dion Skipper was found in Deerfield (1, 7/6/2013, B. Benner), the first report ever from Franklin County. These five additional towns (Cummington, Deerfield, Williamsburg, Williamstown and Windsor) appear on Map 104b. Through 2013, Dion Skipper had been found in 15 towns in western Massachusetts. Opler and Krizek’s 1984 range map, like the MAS 1986-90 Atlas map, showed Dion Skipper only in southwestern Massachusetts; both these maps are now out of date. Cech’s 2005 range map includes all of western Massachusetts, and shows a few reports from Vermont. In the 2002-2006 Vermont Butterfly Survey, Dion Skipper was found in 8 atlas blocs, with a total of 20 sight, photo or specimen records. Dion Skipper occurs as far north as Burlington area and Grand Isle in Lake Champlain (VBS 2010). It has also been known since 1991 north of Vermont in Canada in Quebec in the St. Lawrence valley (Layberry 1998). Whether it also inhabited these northern areas a century ago is uncertain, although there are museum specimens from Grand Isle, Vermont. Dion Skipper is univoltine at this latitude. Between 1992 and 2013, all sightings of Dion Skipper occurred between late June and the end of July. These dates are both earlier and later than those shown on the 1993-2008 MBC flight chart (http://www.naba.org/chapters/nabambc/flight-dates-chart.asp). The flight period still seems fairly concentrated. Earliest sightings: In the 22 years of BOM-MBC records 1992 through 2013, the five earliest "first sightings" are 6/27/2010 Williamsburg Graves Farm, B. Benner; 6/30/2012 Northampton Fitzgerald Lake, T. Gagnon; 7/4/2013 Northampton Fitzgerald Lake, J. Rose et al. ; 7/4/2005, North Adams, R. and S. Cloutier; and 7/5/1999 Richmond, T. Gagnon. The influence of the particularly warm springs of 2012 and 2010 may be at work here. But the fact that first sightings over these 22 years are becoming somewhat earlier could as well be due to either greater observer effort or growth in the butterfly population, or both. Latest sightings: Over the same 22 years, the three latest "last sightings" are 7/26/1997 Central Berkshire NABA Count, T. Tyning et al. ; 7/23/2000, Central Berkshire NABA Count; and 7/22/2007 North Adams, R. Hamburger. Shapiro (1974) gives the flight period in the New York Finger Lakes region as July 1- August 4, and all 1990-95 Connecticut Atlas sightings and specimens are from July or the first week of August (O’Donnell et al. 2007). The Massachusetts sightings are comparable to these periods, and thus seem to represent over-wintering colonies and individuals rather than long-distance dispersals. Dion Skipper is not a recent and seasonal southern immigrant, like Ocola or Fiery Skippers, but rather an uncommon marsh skipper which might have been here unnoticed since postglacial times. In habitat it is similar to Two-spotted Skipper, Black Dash and Mulberry Wing, but unlike these species it does have a midwestern and southeastern coastal range. In Massachusetts Dion Skipper may be threatened by habitat loss and hydrologic alteration that disrupts the flooding regime in its habitat. Common reed (Phragmites australis) and other invasive wetland plants may degrade and destroy habitat. Other potential threats include introduced generalist parasitoids and insecticide spraying (NHESP 2/2010). Dion Skipper is a Threatened species in Massachusetts, and sightings should be reported at http://www.mass.gov/dfwele/dfw/nhesp/species_info/pdf/electronic_animal_form.pdf . While habitat conservation is important, it does not guarantee the presence of the skipper. 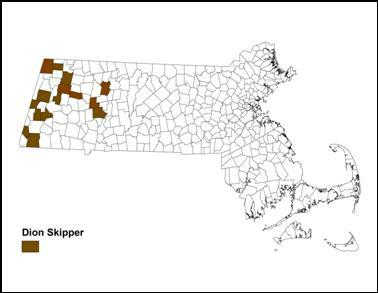 Dion Skipper may be less common than its habitat in Massachusetts, so conservation efforts need to be focused on existing populations of the butterfly itself, rather than solely on conserving likely habitat. More searches should be made of known habitat (e.g. North Adams), and known butterfly populations should be monitored yearly.